Little, Brown Books for Young Readers, 9780316391870, 224pp. Theo Stein-Meyer loves being part of the Magic Misfits. Armed with his trusty violin bow, he completes the team with his levitation skills, unflappable calm, and proper manners. But when a girl named Emily begins to spend time with the group, Theo is surprisingly drawn to her. She seems to understand the pull he feels between music and magic, between family and friends. Then a famous ventriloquist arrives in town, and the Misfits are sure he (and his creepy dummy) are up to no good. With their mentor, Mr. Vernon, suddenly called away and tension simmering among the friends, can they come together to stop another member of the villainous Emerald Ring? It's time for Theo to make a choice about where--and with whom--he belongs. 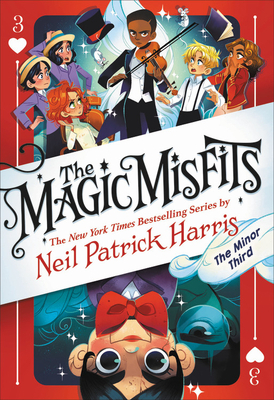 Join the Magic Misfits as they discover adventure, friendship, and more than a few hidden secrets in this unique and surprising series. Whether you're a long-time expert at illusion or simply a new fan of stage magic, hold on to your top hat! Neil Patrick Harris is an accomplished actor, producer, director, host, author, husband, and father of magical twins. Harris also served as President of the Academy of Magical Arts from 2011-2014. His memoir, Choose Your Own Autobiography, was a New York Times bestseller. The New York Times bestselling Magic Misfits series is his middle grade debut.